Moms are short on time, busier than ever and craving connection. We dream of a cute little house with the white picket fence, but somehow reality doesn’t match up to our expectations! Heather has been there. She knows what it’s like to struggle with reality and wonder where God is in the midst of it. Heather passionately shares how she found God in the trenches of motherhood, drawing on her experiences of a broken home, assault, teenage motherhood, infertility & miscarriage, caring for a child with special needs and learning how to love her husband. All to often our lives are in pieces and we feel small, unworthy, and insignificant. We question if we’re even mothering the right way, but Heather’s passion is to open the eyes of women with power of answering yes to God. Because when a women’s eyes are opened to who God has called her to be–she has the power to sculpt and shape future generations while resting in God’s amazing grace. Let Heather take you on a journey to discover freedom in who God has called YOU to be as a wife, mom and woman! When Heather speaks and writes, she boldly takes women by the hand and leads them to the home their hearts have ached for—a place where God fits the messy moments and broken pieces of their lives and fits them perfectly together through his amazing grace. Click here for Heather’s Brochure: About Heather Riggleman Brochure to share with your groups. Click here for Heather’s Press Kit: Press Kit Heather Riggleman. Enclosed you will find Heather’s bio, where to find her work, information about her books, websites, affiliates, and what she offers for speaking, book signings, and workshops. Heather is available for media appearances, speaking engagements, and book signings. Enclosed you will find Heather’s bio, where to find her work in print and online, various speaking topics, affiliates, websites, and book overview. Do you ever wonder if this is really the life that God intended for you to live? How do you deal when your plans don’t go according to plan? Let Heather take you by the hand and lead you to the home your heart has longed for, a place where God fits all the shattered and messy pieces of life–perfectly together. All you have to do is answer YES as he picks up the pieces and calls you to embrace your God given identity. What happens when a woman’s eyes are opened to her amazing God? Her heart is ignites with the desire to reach out and touch those around her, she is able to sculpt and mold the future for Christ!! How to stock a pantry, plan menus, stock the freezer. And many more tips to get through a hectic day. As mothers we sacrifice our bodies, our hearts, our careers, and our own needs for the sake of our families. Does anyone care about the hours we slave away on daily domestic duties of washing and folding socks? We begin to feel invisible, but God sees you as you are and cares about what you do. And what if this realization revived our souls? Once we realize all the work we do isn’t just to keep a neat home but for building the Kingdom of God, it shifts our attitudes and hearts. Women sacrifice much as mother’s. We become consumed and overwhelmed with the task of running a home and raising our children. We begin to feel hidden behind the four walls we call home. God didn’t just create us to mother. He created us to other talents, and gifts. He wants us and even calls us to use our gifts for others. Does it interest you to know that Jesus identifies with mothers? Even Jesus was hidden for 33 years before He began His ministry. We all have a past, some more colorful than others. We have regrets, mistakes, and scars. Some of us have addictions and chains that we are struggling to break free from. How do we break free from the past and begin living as the woman God called us to be? Or better yet, what if we could embrace our past? Join me in being vulnerable, taking a risk to embrace the God who isn’t finished with us yet. Embrace how to encourage your spouse even when you feel they don’t deserve it. Not all of us grew up in a Christian home and yet we find ourselves longing for a relationship with God. Through motherhood, God has shown Heather different facets of his character inviting her to walk with him. Heather shares this message with moms encouraging mothers to take a walk with him. Women who listened to this message, not only related to Heather’s past but also came away inspired and hungry to seek after God. Do you have a teenager who is about to become a mom or were you a teenage mom? How do we gently lead and encourage women who feel they’ve made the biggest mistake of their lives? Let’s encourage and offer hope by focusing on the needs 9 essential needs of a teenage mom. They need to hear their life isn’t over, they are loved, there’s hope and more. 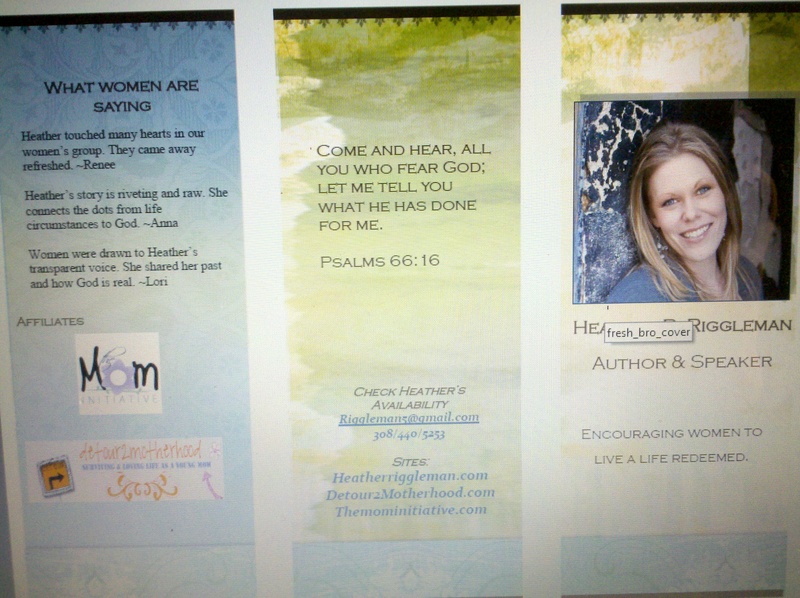 Be sure to visit her new site: www.detour2motherhood.com. (Coming soon). Wanting to go deeper with God? Are you wondering who He is? God has so many names which reveal the vastness and depth of His love for us. He is known as Creator, Husband, Father, God Almighty, The God of Peace, The Lord Who Provides and so much more. Each name is a topic of encouragement of its own. God is calling mothers to come to know Him intimately, to sense His presence in the trenches of motherhood. Let’s call on Him to reveal Himself to us. Let’s ask Him to bless us. Your life seems perfect, everyone thinks you’re sweet-natured, even you think you are calm, cool and collected. Then one day you have kids. Suddenly, the things that come from your own mouth scare you. You feel irritable and frustrated over the silliest of things and wonder where this woman came from. Let’s take a look at the Proverbs 14 woman, she may lend a hand into helping us build up our families and defuse this angry mommy! A wise woman embraces God’s design for home. How does a woman become the kid of wife and mother God has designed her to be? She orders her life according to God’s principles of growth in her relationship with God, respect towards her husband, teaching and training her children. We will review several principles that a woman can use to create the home God has in store for her based on several scripture verses, including: Genesis 2:18, Psalm 54:4, Proverbs 14:1, and Ephesians 5:33. Did you know that you can book a Skype call with Heather for any of your events? Your Skype call with be 30 minutes in length and we will send you handouts, signup sheets and any other fun resources Heather would hand out to your group if she was speaking in person. Choose from any of the topics above for your Skype with Heather event. Note: These are topics I’ve spoken about before. If there is a specific message your group of women or moms needs to hear, please contact me and let’s design a message for your group. I do charge a small fee on top of other traveling and hotel expenses. However, I firmly believe God has called me to speak and make his Word available to all, regardless of ability to pay. We can discuss creative ways to reduce cost of traveling. If a group is able to contribute toward my expenses, then it will help us to continue this ministry.